Posted December 4, 2018 by Will Best & filed under PAT Test Labels. Whether it’s a driving test, a school exam or a dental check up, we all like to receive a seal of approval which proves that our performance was acceptable, of a suitable standard, up to scratch. Some of these tokens are of critical importance – you aren’t allowed to drive a car on the road without a licence – while others are useful in secular and social situations. Just as a driver must pass a test before they are allowed on the road, it is also useful to regularly have office equipment and other machinery examined to check that it is suitable for the environment in which it operates. PAT testing is the most widely accepted scheme for inspecting portable appliances for damage and wear, with the emphasis on personal safety. And in the same way that a pass certificate proves a new driver is up to the task, PAT Test Passed labels can be affixed to inspected equipment to show that the item is suitable for use. 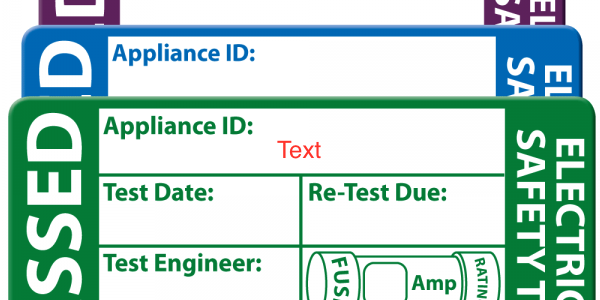 What information is usually found on PAT Test Passed labels? There are many different types, but all carry three critical details: the date the examination was conducted, the identity of the examiner, and whether the product was judged to be fit for use or not. Without at least these three particulars, a Pat Test Passed Label is pointless. Passed PAT Test Labels which store further information are also available from PAT Labels Online. Have your company name and logo printed on each sticker, or order labels with spaces for retest dates and appliance ID numbers, it really is up to you. If you have any queries about our custom label service or need any advice, place don’t hesitate to get in touch. Electrical devices are not the only equipment in the workplace which benefits from periodic safety testing. Handling gear such as ladders can expose staff to danger if they fall into disrepair. But once again, PAT Labels Online have got you covered. Our Passed Ladder Safety Inspection Labels can be affixed to wooden, aluminium or steel ladders, steps, or similar equipment. In each case, a careful inspection of the ladder should be made to assess Its condition. This involves checking the ‘legs’ (the side pieces of the ladder) for cracking, warping, or other signs of fatigue. Each rung should be tested for strength, and checked for tread. Weak, loose or slippery rungs would render the ladder unusable until it is repaired. Provided the ladder or set of steps satisfies the above safety requirements, it can be issued with a Passed Ladder Safety Inspection Label. This will instil confidence in anyone who needs to use the equipment. It is also a good way of recording the date the item was checked, so that the process can be repeated periodically. Besides Passed Ladder Safety Inspection Labels and Passed Pat Test Labels, we have a whole range of similar products to be found on our website, so stock up on stickers today!